Divergent Views of His Character. 1. Son of Cain (Gen. iv. 17). A city was named after him. 2. Biblical Data: Name of the seventh progenitor of the race in the "book of the generations of Adam"; he was the son of Jared and the father of Methuselah (Gen. v.). He lived 365 years, and is described as "walking with God," his end being told in the words "and he was not; for God took him" (ib. 24). No further reference to Enoch is found in Hebrew Scripture, unless the ingenious emendation in Ezekiel (xiv. 14, 20; xxviii. 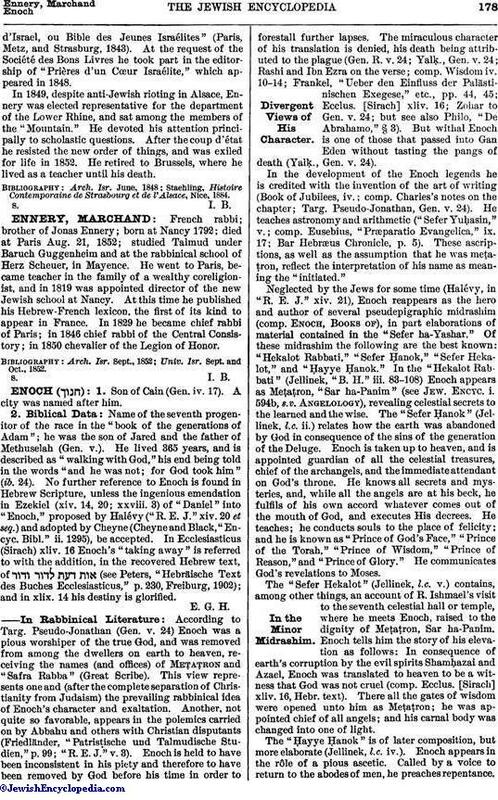 3) of "Daniel" into "Enoch," proposed by Halévy ("R. E. J." xiv. 20 et seq.) and adopted by Cheyne (Cheyne and Black, "Encyc. Bibl." ii. 1295), be accepted. In Ecclesiasticus (Sirach) xliv. 16 Enoch's "taking away" is referred to with the addition, in the recovered Hebrew text, of (see Peters, "Hebräische Text des Buches Ecclesiasticus," p. 230, Freiburg, 1902); and in xlix. 14 his destiny is glorified. According to Targ. Pseudo-Jonathan (Gen. v. 24) Enoch was a pious worshiper of the true God, and was removed from among the dwellers on earth to heaven, receiving the names (and offices) of Meṭaṭron and "Safra Rabba" (Great Scribe). This view represents one and (after the complete separation of Christianity from Judaism) the prevailing rabbinical idea of Enoch's character and exaltation. Another, not quite so favorable, appears in the polemics carried on by Abbahu and others with Christian disputants (Friedländer, "Patristische und Talmudische Studien," p. 99; "R. E. J." v. 3). Enoch is held to have been inconsistent in his piety and therefore to have been removed by God before his time in order to forestall further lapses. The miraculous character of his translation is denied, his death being attributed to the plague (Gen. R. v. 24; Yalk., Gen. v. 24; Rashi and Ibn Ezra on the verse; comp. Wisdom iv. 10-14; Frankel, "Ueber den Einfluss der Palästinischen Exegese," etc., pp. 44, 45; Ecclus. [Sirach] xliv. 16; Zohar to Gen. v. 24; but see also Philo, "De Abrahamo," § 3). But withal Enoch is one of those that passed into Gan Eden without tasting the pangs of death (Yalḳ., Gen. v. 24). In the development of the Enoch legends he is credited with the invention of the art of writing (Book of Jubilees, iv. ; comp. Charles's notes on the chapter; Targ. Pseudo-Jonathan, Gen. v. 24). He teaches astronomy and arithmetic ("Sefer Yuḥasin," v.; comp. Eusebius, "Præparatio Evangelica," ix. 17; Bar Hebræus Chronicle, p. 5). These ascriptions, as well as the assumption that he was meṭaṭron, reflect the interpretation of his name as meaning the "initiated." Neglected by the Jews for some time (Halévy, in "R. E. J." xiv. 21), Enoch reappears as the hero and author of several pseudepigraphic midrashim (comp. Enoch, Books of), in part elaborations of material contained in the "Sefer ha-Yashar." Of these midrashim the following are the best known: "Hekalot Rabbati," "Sefer Ḥanok," "Sefer Hekalot," and "Ḥayye Ḥanok." In the "Hekalot Rabbati" (Jellinek, "B. H." iii. 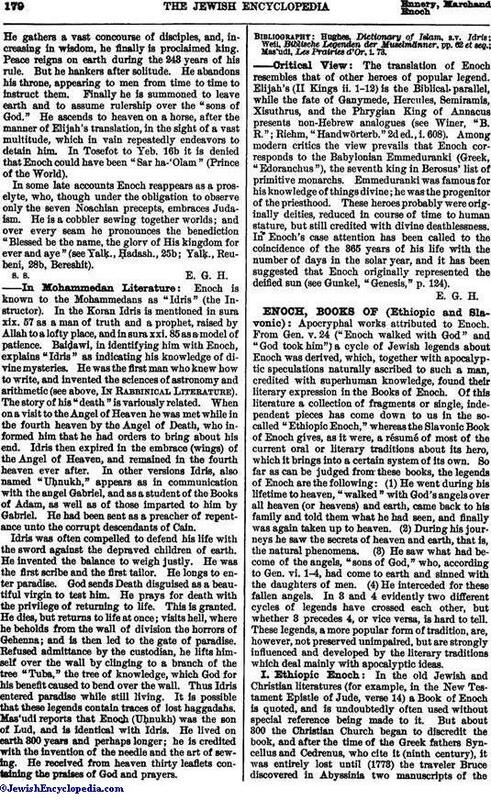 83-108) Enoch appears as Meṭaṭron, "Sar ha-Panim" (see Jew. Encyc. i. 594b, s.v. Angelology), revealing celestial secrets to the learned and the wise. The "Sefer Ḥanok" (Jellinek, l.c. ii.) relates how the earth was abandoned by God in consequence of the sins of the generation of the Deluge. Enoch is taken up to heaven, and is appointed guardian of all the celestial treasures, chief of the archangels, and the immediate attendant on God's throne. He knows all secrets and mysteries, and, while all the angels are at his beck, he fulfils of his own accord whatever comes out of the mouth of God, and executes His decrees. He teaches; he conducts souls to the place of felicity; and he is known as "Prince of God's Face," "Prince of the Torah," "Prince of Wisdom," "Prince of Reason," and "Prince of Glory." He communicates God's revelations to Moses. The "Sefer Hekalot" (Jellinek, l.c. v.) contains, among other things, an account of R. Ishmael's visit to the seventh celestial hall or temple, where he meets Enoch, raised to the dignity of Meṭaṭron, Sar ha-Panim. Enoch tells him the story of his elevation as follows: In consequence of earth's corruption by the evil spirits Shamḥazai and Azael, Enoch was translated to heaven to be a witness that God was not cruel (comp. Ecclus. [Sirach] xliv. 16, Hebr. text). There all the gates of wisdom were opened unto him as Meṭaṭron; he was appointed chief of all angels; and his carnal body was changed into one of light. The "Ḥayye Ḥanok" is of later composition, but more elaborate (Jellinek, l.c. iv.). Enoch appears in the rôle of a pious ascetic. Called by a voice to return to the abodes of men, he preaches repentance.He gathers a vast concourse of disciples, and, increasing in wisdom, he finally is proclaimed king. Peace reigns on earth during the 243 years of his rule. But he hankers after solitude. He abandons his throne, appearing to men from time to time to instruct them. Finally he is summoned to leave earth and to assume rulership over the "sons of God." He ascends to heaven on a horse, after the manner of Elijah's translation, in the sight of a vast multitude, which in vain repeatedly endeavors to detain him. In Tosefot to Yeb. 16b it is denied that Enoch could have been "Sar ha-'Olam" (Prince of the World). In some late accounts Enoch reappears as a proselyte, who, though under the obligation to observe only the seven Noachian precepts, embraces Judaism. He is a cobbler sewing together worlds; and over every seam he pronounces the benediction "Blessed be the name, the glory of His kingdom for ever and aye" (see Yalḳ., Ḥadash., 25b; Yalḳ., Reubeni, 28b, Bereshit). Enoch is known to the Mohammedans as "Idris" (the Instructor). In the Koran Idris is mentioned in sura xix. 57 as a man of truth and a prophet, raised by Allah to a lofty place, and in sura xxi. 85 as a model of patience. Baidawi, in identifying him with Enoch, explains "Idris" as indicating his knowledge of divine mysteries. He was the first man who knew how to write, and invented the sciences of astronomy and arithmetic (see above, In Rabbinical Literature). The story of his "death" is variously related. When on a visit to the Angel of Heaven he was met while in the fourth heaven by the Angel of Death, who informed him that he had orders to bring about his end. Idris then expired in the embrace (wings) of the Angel of Heaven, and remained in the fourth heaven ever after. In other versions Idris, also named "Uḥnukh," appears as in communication with the angel Gabriel, and as a student of the Books of Adam, as well as of those imparted to him by Gabriel. He had been sent as a preacher of repentance unto the corrupt descendants of Cain. Idris was often compelled to defend his life with the sword against the depraved children of earth. He invented the balance to weigh justly. He was the first scribe and the first tailor. He longs to enter paradise. God sends Death disguised as a beautiful virgin to test him. He prays for death with the privilege of returning to life. This is granted. He dies, but returns to life at once; visits hell, where he beholds from the wall of division the horrors of Gehenna; and is then led to the gate of paradise. Refused admittance by the custodian, he lifts himself over the wall by clinging to a branch of the tree "Tuba," the tree of knowledge, which God for his benefit caused to bend over the wall. Thus Idris entered paradise while still living. It is possible that these legends contain traces of lost haggadahs. Mas'udi reports that Enoch (Uḥnukh) was the son of Lud, and is identical with Idris. He lived on earth 300 years and perhaps longer; he is credited with the invention of the needle and the art of sewing. He received from heaven thirty leaflets containing the praises of God and prayers. Mas'udi, Les Prairies d'Or, i. 73. The translation of Enoch resembles that of other heroes of popular legend. Elijah's (II Kings ii. 1-12) is the Biblical parallel, while the fate of Ganymede, Hercules, Semiramis, Xisuthrus, and the Phrygian King of Annacus presents non-Hebrew analogues (see Winer, "B. R."; Riehm, "Handwörterb." 2d ed., i. 608). Among modern critics the view prevails that Enoch corresponds to the Babylonian Emmeduranki (Greek, "Edoranchus"), the seventh king in Berosus' list of primitive monarchs. Emmeduranki was famous for his knowledge of things divine; he was the progenitor of the priesthood. These heroes probably were originally deities, reduced in course of time to human stature, but still credited with divine deathlessness. In Enoch's case attention has been called to the coincidence of the 365 years of his life with the number of days in the solar year, and it has been suggested that Enoch originally represented the deified sun (see Gunkel, "Genesis," p. 124).